Fiber tech Rick Chislett delicately fed a glass fiber the thickness of a human hair into a piece of electronic equipment- and there was light. “The first one’s OK,” he said after a minute. “We can see Juneau.” After spending nearly $11 million and years in development, Alaska Power and Telephone’s Lynn Canal Fiber linking Skagway and Haines to Juneau and possibly the Yukon was completed. It will bring faster, more reliable internet service to Haines and Skagway — and possibly to the Yukon as well. 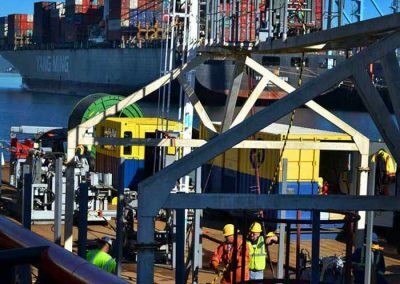 The Lynn Canal Fiber project brought together an international coalition of partners contracted by AP&T. 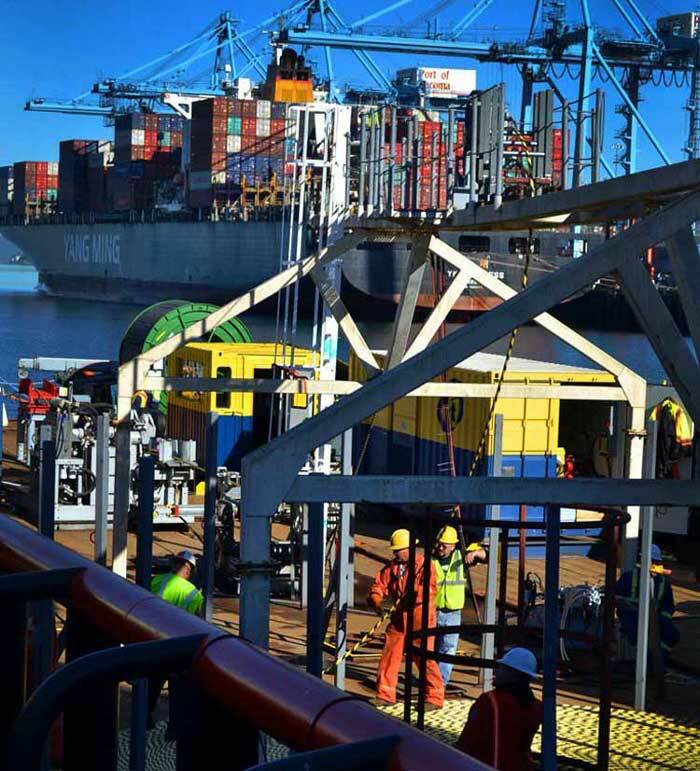 NSW out of Germany (a subsidiary of General Cable ) provided a turnkey solution enlisting fiber techs from International Telecom out of Montreal and the cable laying vessel Silver Arrow, part of the world-wide Horbeck Offshore Fleet of maritime operations. Laying alongside Haines’ Lutak Highway, it was unassuming, a one-inch diameter snake with barber-poled yellow and black stripes obscured by gray muck. International Telecom’s Kevin DeMont revealed its construction as he cut into it with a grinder. In a spray of sparks he tore away one layer of wound steel wire, then another. The Silver Arrow feeds the last segment of AP&T’s 86-mile fiber optic cable from Juneau, ashore in Smugglers Cove near Skagway, Alaska. Below the layers of wire was a plastic seal, another layer of steel wire, a copper tube, then three colored strands slightly thicker than high-test fishing line. One at a time, carefully, they removed microscopic color-coding and cladding to reveal the hair-width glass fibers within. They’re the bones of the internet here, in Juneau and around the world. No other mainstream technology can carry information as effectively and in such large volume. When Chislett said he could see Juneau, his equipment could literally “see” flashes of laser light sent 71 miles to the capital city and returned to him. AP&T has the capability to use 40 wavelengths in a single fiber — and there are 36 fibers in AP&T’s new cable. If AP&T’s existing service to Haines and Skagway is a two-lane road, a single wavelength is a 20-lane road. A single fiber is an 800-lane road. The cable as a whole is a road with 28,800 lanes. In late January of 2017 AP&T plans to roll-out 4 new primary service tiers to Skagway and Haines residential and business internet subscribers providing greater value and speeds in the Upper Lynn Canal region. These new broadband tiers range in speeds and usage from 5Mb/1Mb with 150GB of usage for $49.95 per mo to 25Mb/1GB with 600GB of usage for $229.95 per mo. Also on the horizon for 2017-18 are plans to invest another million dollars in land-based outside plant fiber infrastructure in the region. 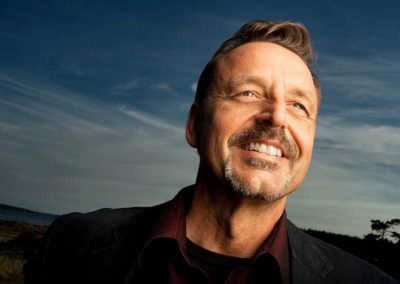 “The potential to empower the lives and livelihoods of residents in this region is tremendous,” stated Michael Garrett Michael Garrett AP&T’s current chief operations officer who spearheaded the development of the Lynn Canal Fiber project. At the end of this year, Garrett will replace Robert Grimm as the company’s President and CEO. 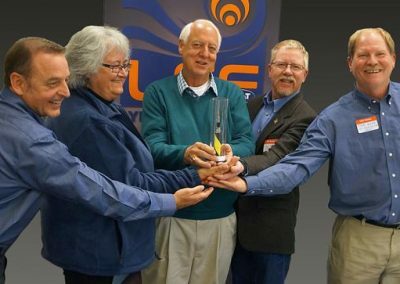 Holding a piece of the Lynn Canal Fiber representing the new connectivity between their respective communities are Haines Mayor Jan Hill, Juneau Mayor Ken Koelsch and Skagway Mayor Mark Schaefer flanked by AP&T’s Mike Garrett and Tom Ervin. 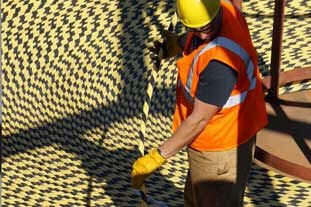 86 miles of cable were carefully hand-wound into position on the ship.